What I love most about this recipe is that everything is cooked in one pan. It’s simple to prepare and bursting with a ton of flavor. We served this dish alongside some lemon parmesan pasta for a simple weeknight meal at home. I love the spinach that we grow at Tumbleweed Farm (Emperor is the variety). This particular variety has large leaves that are extremely hearty which makes them great for sautéing. We’ve been cooking our spinach in bacon grease almost every morning for the past few weeks and it’s so damn good! I decided to up my game a bit and use some locally foraged Chanterelle mushrooms (thanks Colin!) and cook everything in some bacon fat and white wine. 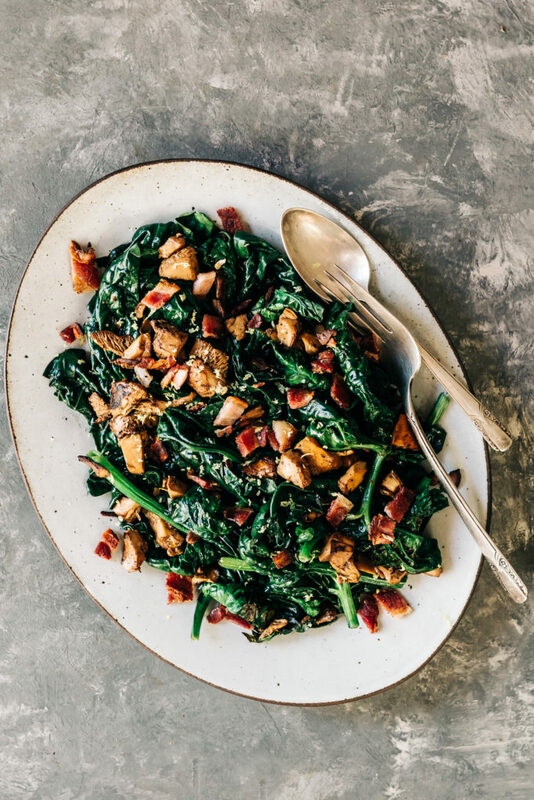 The spinach becomes extremely tender and the mushrooms and bacon add great depth of flavor. This is something I can see folks whipping up regularly to help complete their dinner menu. And hey, this would also taste great for breakfast with a few poached eggs on top. Go wild! Cheers to the fall bounty! In a large heavy bottom pan, fry the chopped up bacon over medium high heat. Cook until lightly crispy on all sides. Remove the bacon from the pan to a paper towel lined plate to drain. Reserve the bacon grease in the pan and add the shallot and mushrooms. Cook, stirring occasionally for about 3 minutes. Add the garlic, crushed red pepper flakes and white wine. Continue to cook until most of the liquid has evaporated. Toss in the spinach, and use tongs to continue to toss the mixture until the spinach is wilted and tender. About 3 minutes. Add the bacon back to the pan and grate in the lemon zest and season to taste with salt and pepper. Serve warm. YUM! Looks delicious, Andrea! Can’t wait to make it… Saw your mom in Concord last weekend. What a treat! Let us know when you’re here as we’d love to see you too! Lovely and very healthy and easy recipe! Thank you for sharing it!